Hurricane Florence dominated headlines with tales of the catastrophic damage caused by winds, rain and flooding. Each of these elements unleashed by Mother Nature brought into focus the instability of different structures– trees, buildings, bridges and roads – when lashed by extreme conditions. If the foundation in any system isn’t strong enough to resist outside forces – even those much less powerful than a hurricane – we will witness instability or even the failure of that structure. Tents are no different. Hopefully, your company doesn’t make a habit of leaving tents up in the middle of hurricanes, but your tent installation and its ultimate survivability against the conditions Mother Nature can dish out depends on the strength of its foundation. For tents, the underpinning of any strong foundation is the anchoring. Whether you’re installing a pole tent or a frame tent, proper anchoring is vital. At TopTec Event Tents, we believe that staking is still the most efficient way to anchor a tent; and as a manufacturer, it’s the preferred method we teach at our annual Tent School training program. However, before the first stake goes into the ground, we recommend a thorough site survey. What are your ground conditions? Are they safe? How firm is the soil? Do you have the proper anchoring system in your inventory to securely stake this tent with all factors considered? Installers who fail to do a thorough check of the tent site could overlook an anchoring issue that could ultimately determine the success or failure of that installation. TopTec recommends stakes because they consume very little space, are quick to install, and have more holding power than two water barrels in average soil. 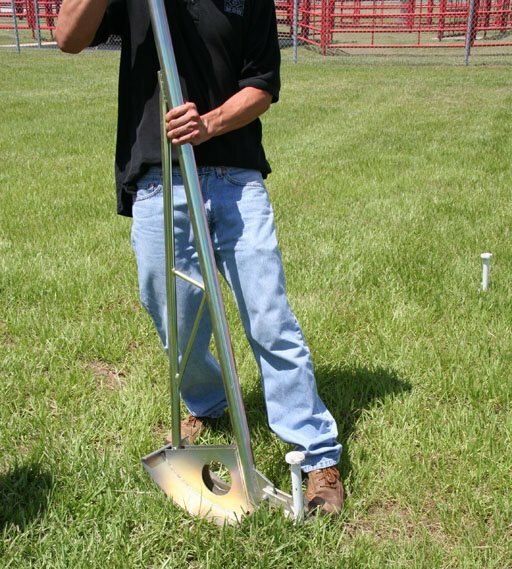 Data from scientific studies conducted over many years, shows that a 1”x40” stake will hold approximately 1,000 pounds in average soil. In recent years, alternative anchoring methods have been a hot topic including ballasting and the iconic water barrels. Ballasting is an effective way of anchoring a frame tent, but what looks like a lot of weight, may not be enough for even a sudden strong gust of wind during an unexpected summer storm. Water barrels have been used for years, and although there is an appropriate number of barrels for any installation, we often see tents where the necessary number of water barrels have been sacrificed to improve site aesthetics. In adverse weather, the structural integrity of tents without adequate support could fail. Your tent manufacturer should be able to tell you the anchor pounds required for any of their tents. As the installer, you would then be responsible for determining the holding capacity of the soil and calculate the proper number of stakes for that site and soil conditions. If the tent requires more anchoring pounds than a single stake will hold, other methods should be used to increase the holding power of the stakes. Often, dealers rely on gang staking – using multiple stakes that act together – with stake bars for added stability. Installers attending TopTec’s Tent School in December can learn about a wide variety of staking methods and witness a stake pullout study using a tow truck as Mother Nature. A dynamometer is used to gather the data from the tensions achieved. Attendees can then compare the efficacy of a variety of staking systems and what represents failure in each. The Industrial Fabrics Association commissioned a study on staking years ago and have a verifiable method for determining the holding capacity of the soil an installer finds on any given tent site. Their manual, IFAI Procedural Handbook For The Safe Installation and Maintenance of Tentage is one we recommend to all tent companies. You can contact the IFAI Tent Rental Division for a copy of this manual.